Energy Efficient Windows Market size was valued above USD 6 billion in 2015, with industry anticipating over 10% growth by 2024. Rising energy conservation demand accompanied with increasing awareness to minimize carbon footprints is anticipated to be key factor propelling industry growth. Residential buildings accounts over 20% of the total energy consumption in the United States. In addition, these are accountable for 25% to 30% of the total residential heating and cooling energy consumption. This results in higher electricity consumption for maintaining room temperature. Energy efficient window installation helps in minimizing energy consumption for cooling and heating purposes. European Union commitment to reduce over 300 million tons of CO2 emissions annually. As per the government stats, majority of emissions is contributed by residential and commercial buildings. As a result, this may positively influence global market growth over the forecast timeframe. EU also aims to save around 20% of the overall energy requirement in near future. Improved living standards amongst customers coupled with highly fluctuating temperatures across different zones has driven air conditioning and heating systems demand in residential and commercial buildings. For instance, over 90% households in Greece have air conditioning. More air-conditioning signifies high energy demand, which consequently contributes in greenhouse emissions. The ability of these products to maintain room temperature will reduce emissions along with reduced power consumption. Global construction industry is witnessing significant growth across the globe and is supported by government initiatives such as zero energy building, energy efficient building, and others. For example, the U.S. government has developed new energy code named ‘Energy Star’ which directs implementation towards reducing power consumption. Consumption in buildings is mainly contributed by lighting, ventilation, space cooling, space heating, refrigeration, and water heating. The government has introduced subsidies to promote energy efficient windows in order to minimize carbon footprints. As a result, over 80% of total window sales are mainly contributed by Energy Star. Positive infrastructure spending indicators, across Asia Pacific will drive regional construction demand. Furthermore, the forecast period should witness shift towards these products to minimize consumption rate, particularly in Europe and Asia Pacific owing to the regulatory landscape, establishing stringent specifications for energy conservation. Energy efficient windows market price trends are comparatively expensive than traditionally used counterparts, this may hinder industry growth over the forecast timeframe. However, the return has benefits monetarily in terms of low energy bills and environmentally as reduced carbon emissions. Double glazing energy efficient windows market size will continue to dominate by 2024. It is double window separated by vacuum or gas filled space to minimize heat transfer. Increasing need to maintain room temperature in residential and commercial buildings by restricting outside heat flows may stimulate demand. Triple Low-E glazing is projected to expand at over 11% CAGR from 2016 to 2024. Increasing private sector R&D spending coupled with initiatives such as Energy Star to reduce energy consumption particularly in buildings is playing active role in driving Triple Low-E glazing penetration. Replacement adoption was the larger market share contributor in 2015. 15 to 20 years old buildings mostly require replacement which may drive industry growth. Also, increasing renovation activities particularly in North America and Europe owing to dual income families and improved living standards are switching towards these products to minimize annual consumption. Insulation adoption is forecast to witness gains at over 11% CAGR up to 2024. High replacement cost is likely to drive segment revenue. On an average, a 2500 square feet house costs over USD 15,000 for replacement, which is around 50% to 60% higher than insulation. Residential applications, driven by strong consumer awareness trends are set to lead demand. 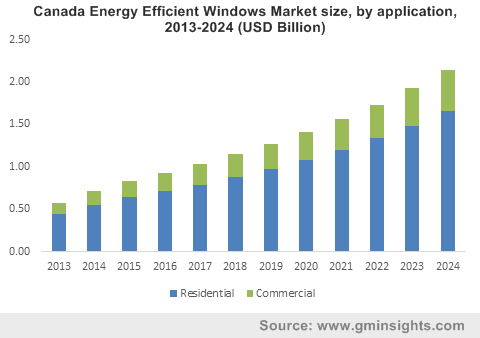 Growing residential construction projects coupled with increasing customer awareness towards minimizing energy consumption may boost residential energy efficient windows market size. Commercial application is forecast to expand at over 10% CAGR over the forecast timeframe. Rapid commercialization coupled with government initiative to promote energy efficient buildings is likely to drive industry growth. U.S. energy efficient windows market size continues to show over 10% growth. The region has witness significant government support for promoting energy efficient products. For instance, Building Technologies Program (BTP) by Department of Energy office of Energy Efficiency and Renewable Energy (EERE) has made huge R&D investment. BTP is engaged with increasing energy efficiency and minimizing carbon emissions in the buildings sector of the U.S. economy. Europe market share, while relatively nascent in terms of penetration, should see strong gains by 2024. Asia Pacific is projected to witness gains at over 11.5% CAGR from 2016 to 2024. Growing construction industry particularly in China, Japan, and India may positively influence demand over the forecast timeframe. Global energy efficient windows market share is competitive. Major industry participants include Milgard Manufacturing Inc., Marvin, and Soft-Lite. Other contributors include Atrium Corporation, Pella Corporation, Andersen Corporation, Associated Material Inc., Jeld-Wen Inc., YKK AP Inc., and Kolbe & Kolbe millwork Company. The energy efficient window industry is witnessing exponential gains due to rising awareness coupled with pressure from international and government bodies to minimize annual energy consumption and carbon footprints. It helps in maintaining room temperature by absorbing or reflecting outside heat and cool flows, which will reduce air conditioning and heating energy consumption.